Editor’s Note: This is a final post from the 227th AAS Meeting in Kissimmee, FL. This special summary of AAS Hack Day, a meeting of AAS members to collaboratively work on various small projects, was written by Meredith Rawls (@Merrdiff) and was originally posted on astrobites.com. As the 227th American Astronomical Society meeting drew to a close (see highlights from Day 1, Day 2, Day 3, and Day 4), a group of at least 50 attendees spent “Day 4” working on small projects fondly called hacks. Thanks to sponsorship from LSST and Northrup Grumman, the industrious hackers were well-caffeinated and fed so we could devote time and energy to working in groups on one-day projects. The Hack Day began at 10am with pitches. Anybody with a project idea was welcome to briefly speak and try to convince others to work with them. Only some ideas panned out, but the enthusiasm was palpable. It’s not every day you get a full room of astronomers and affiliates eager to spend hours working on fun and useful projects to benefit the community. Here is a rundown of what we accomplished. Pretty impressive for a single day! Many thanks to fellow astrobiter Erika Nesvold (now at Carnegie DTM; @erikanesvold) whose hack was live-documenting all the other hacks. Her tweets as @astrobites appeared with the #hackaas hashtag, and her notes made this recap post infinitely easier to write. Interested in joining the fun? Sign up for Hack Day at the 2017 January AAS meeting (it’s free with meeting registration), and consider applying for the .Astronomy conference this summer. Towards Optimal Session Scheduling: Adrian Price-Whelan (Columbia), David Hogg (NYU), and Scott Idem (AAS) began writing a program to take all submitted abstracts to a conference like AAS and sort them using keywords to avoid scheduling similar talks in parallel sessions. It’s impossible to make everyone happy, but minimizing conflicts will be a huge first step. Gender in Astronomy Conferences: Jim Davenport (WWU), Ben Nelson (Northwestern), Mehmet Alpsalan (NASA Ames), and Erin Maier (University of Iowa) analyzed data collected during the conference on the gender breakdown of who asks questions after oral presentations. Now in its third year, one new finding from the study is that women don’t ask questions as much as men do, but they tend to ask questions more when the speaker is a woman or the first question-asker is a woman. The Early Reference Project: Many pre-1950 publications lack up-to-date citation information because the text is digitally archived as an image. Brendan Wells (UC Santa Cruz) worked with representatives from ADS and Zooniverse to set up a crowd-sourced platform to identify references in these old papers. Glassdome: Ellie Schwab (CUNY) and colleagues Paige Godfrey, Munazza Alam, and Cam Buzzard began work on a website modeled after glassdoor for safely sharing experiences throughout their astronomy careers. Glassdome will feature career path stories, department reviews, and salaries, all optionally anonymous. The site is hosted by ScienceBetter and is under development. Observing Run Sharing: Sometimes near the end of a long night at the telescope you have observed everything you need but still have time left. Short of choosing randomly or hoping a colleague is online in the middle of the night, there is currently no good solution. To address this, Brooke Simmons (UC San Diego) designed a web app that would allow astronomers to submit their favorite night sky targets. The project is still a work in progress. ArXiv Podcast: Ruth Angus (Oxford) started a podcast featuring astronomers summarizing their new papers submitted to astro-ph in one minute. It’s like audio astrobites! If you’ve recently published a paper, Ruth is seeking contributions of one-minute audio recordings. RadioFree LST: Radio observers don’t care when the Sun is up, but they do care if their astronomical objects of interest are above the horizon. Demitri Muna (Ohio State) and Amanda Kepley (NRAO) created a calculator which uses local sidereal time (LST) to determine when sources rise and set based on the position of the observatory and the coordinates of the target. Hidden Killer Detective: The Kepler spacecraft has enabled many discoveries related to exoplanets and stars. But now that K2 is observing in the ecliptic plane, it should also find asteroids. Geert Barentsen (NASA Ames), Tom Barclay (NASA Ames), Meg Schwamb (ASIAA), and Brooke Simmons (UC San Diego) created a new crowd-sourced Zooniverse project so anyone can help search for moving objects that may be asteroids. Expanding Astronomy on Tap: This casual science pub night, started in 2013, is now a regular event in seven cities worldwide. Jeff Silverman (UT Austin) created a Launch Manifesto and guide for bringing Astronomy on Tap to your own city. If you’re interested, fill out their survey to get more information. The Arceli Project: Arceli is publishing online astronomy content. A team led by ScienceBetter and Kelle Cruz (CUNY) including Daina Bouquin (Harvard CfA), Aram Zucker-Scharff, Lars Holm Nielsen (CERN), Jonathan Sick (LSST), Chris Erdmann (Harvard CfA), and Meredith Rawls (NMSU) worked on getting each component of Arceli to talk to the others. Eventually, Arceli will accept submissions of informal scholarly content—like blog posts—which will become archived and citable just like traditional papers. Special Dark: Leonidas Moustakas (JPL/Caltech) and Tonima Ananna (Yale) hosted a special session at this year’s AAS meeting all about dark matter. During hack day, they began a repository for information that may help constrain the nature of dark matter. Assuming dark matter is a particle, many different kinds of astronomical observations can help nail down its properties, but they are scattered all over the literature. The goal is to compile these observations in one place so the community can piece together a more complete picture of dark matter. A preliminary table of overlap from different astronomical surveys is available online. BibTeX Updater: Mike Lund (Vanderbilt) wrote a python program that takes a citation database created by Mendeley and updates its BibTeX reference information. This tool will help anyone who uses Mendeley as a citation manager and writes papers in LaTeX with BibTeX. By the end of the day, someone from Mendeley had already gotten in touch with Mike to talk about implementing his fixes! Improved Plotly Colormaps: The open source Java graphing code plotly.js lacks colorblind-friendly color tables, so Timothy Pickering (STScI) added some. The color schemes include the new default “viridis” from matplotlib and are perceptually uniform, meaning they don’t have any significant perceptual “jumps” in color. They are better for displaying data whether you’re colorblind or not. Look for the new colors to be available after he submits a pull request to the main plotly repository. Interfacing with Amazon’s Web Services: Meagan Lang (UIUC), Kyle Conroy (Vanderbilt), and Kaylan Burleigh (UC Berkeley/LBNL) worked on a package to streamline running computing jobs with Amazon’s distributed computing. Right now, you can run parallelized computer programs with Amazon Web Services and pay per CPU-hour, but it’s a hassle to set everything up and ensure you don’t pay for more time than you need. Their new rc-submit solves this. #MarsFilter: Becky Smethurst (Oxford), Meredith Durbin (STScI), and Jana Grcevich (AMNH) developed a filter for digital photos to make them look like they were taken on Mars by Curiosity. Different Kind of Kepler Light Curve: Every so often, the Kepler spacecraft sends us an image of its entire field of view rather than just small regions of pixels near specific stars. Jennifer Cash (South Carolina U), Lucianne Walkowicz (Adler), and Joe Filipazzo (CUNY) worked with these Full-Frame Images to identify all the sources. The next step is to identify all the stars in the image and perform aperture photometry. There are likely new exoplanets, binary stars, and other interesting variable sources hidden in this dataset. Exoplanets in the WorldWide Telescope (WWT): Did someone say exoplanets? WWT, now run by the AAS, is an open source data visualization tool often used by planetariums to virtually fly around the Universe. David Weigal (Samford U) worked to improve WWT by adding exoplanetary systems. This was tricky, but he was able to demo one example of a planet orbiting a Sirius-like star. Career Paths: Peter Yoachim (UW) and Eric Bellm (Caltech) took different approaches to study career paths in astronomy. Peter tracked how publishing records affect hiring outcomes, while Eric mapped the careers of astronomers with prize fellowships. Explore their findings here and here. 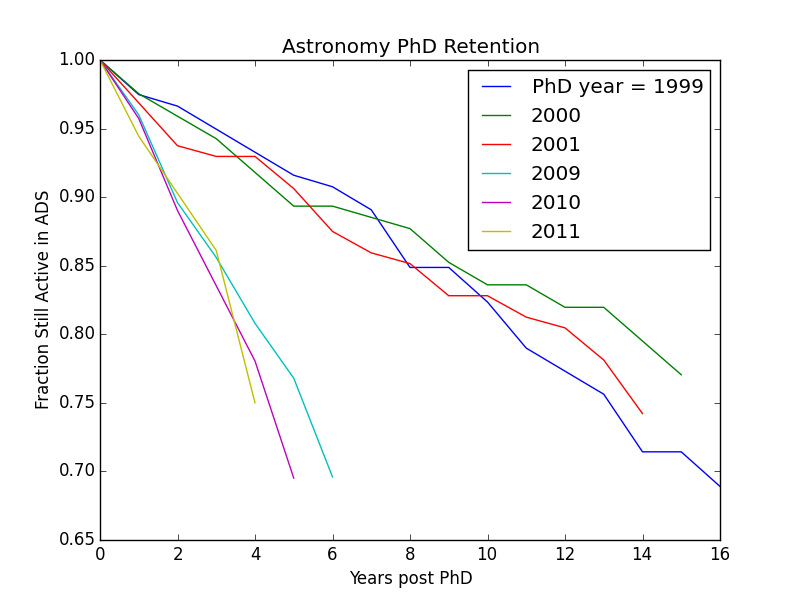 Preliminary results from Peter Yoachim’s project show a significantly lower fraction of recent astronomy PhD recipients continue to publish regularly. Figure courtesy of Peter. Testing Stationarity of Time Series Data: Matthew Graham (Caltech) and Phil Marshall (Slac) wrote some code to determine whether a set of observations taken over a period of time is stationary. This will be useful for surveys like LSST which observe the same source multiple times over many visits. It is important to have a way to quantify if something has changed since the last time we looked at it. Their idea was inspired by a paper about wavelets. FuzzyBlobs: David Nidever (LSST) and Phil Marshall (Slac) worked on a technique to automatically find nearby satellite galaxies to the Milky Way hidden in images from astronomical surveys. The name stems from the fact that satellite galaxies have a low surface brightness and generally appear as faint, fuzzy blobs in images. Fabric Poster Fashion (#makeAAS at #hackAAS): What do you get when you bring a sewing machine to a hack day? Dozens of creative garments and accessories fashioned from research posters printed on fabric! This idea was originated on twitter by Emily Rice (CUNY), Josh Peek (STScI), and Ashley Pagnotta (AMNH), and dozens of astronomers including Rachael Livermore (UT Austin) and Haley Fica (Columbia) participated.